Wes Goldsmith believes he is doing just what he was created to do: graphic design. Since 2014, Wes has served part-time at the Hardin County Chamber and Business Alliance and is currently the graphic designer and social media marketing coordinator. His first graphic design project after graduating from Ohio Northern University was designing the logo for the Hardin County motto. “I pictured myself doing something with my hands, and I feel like I can do that on my computer – I’m using a computer, but I’m also using my mind and I’m creating stuff, which is something I felt like I needed to do,” he said. Wes designs and creates many of the graphics for the chamber’s social media and its emails. “We’re pretty busy doing other stuff, so I don’t have as much time to get on the social media as I’d like to, so everybody kind of does their own social media, but they work with me on it,” Wes said. Wes loves working and living in Hardin County, he said, and through his work with the HCCBA, he believes he and his c-oworkers are able to help the community. “I love the people here,” he said. But his job with the HCCBA is not the only place Wes gets to express his creativity through designing. He and his brother Zac started their own small business a year ago called Log and Jotter (stylized as Log+Jotter), a pocket notebook subscription business. “We design a different cover every month and we send it out,” Wes said. Each month’s notebook, Wes added, is only available to those who are subscribed, meaning certain designs can come to be high in demand. “There’s people scouring the Internet for them – our first one was a plain one and they want to find that plain one,” Wes said. 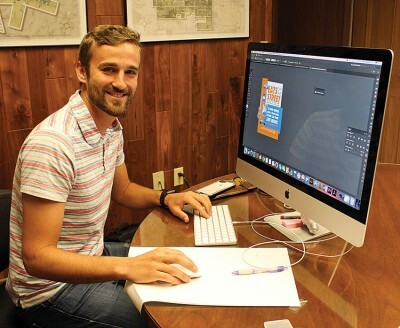 Whether it’s through creating designs for the HCCBA, designing new notebooks for Log and Jotter or doing freelance design work – he is currently working on the Hardin County Fair logo with Kolt Buchenroth – Wes said he loves the satisfaction of building something on his computer and then printing it off and actually seeing it. “There’s a satisfaction of working with your hands,” he said. Wes attends church at Abundant Life Assembly of God in Kenton where his father James serves as pastor. There, he sings and plays guitar on Sunday mornings for the congregation. On Sunday nights, he leads worship and sings and plays for the youth group. On Wednesday nights, Wes can be found at the church with the youth group Royal Rangers, a class for boys from first to eighth grade. There, he helps teach anything from how to tie knots, how to fish, how to camp, how to start fires and how to hike. Thursday nights are spent getting together with the guys from church to play a sport, watch a sports game or go out to eat. Every two years, that same group goes out west to go hiking. Their first trip was to Deacon Lake in Wyoming. This year’s eight-day camping and hiking trip will be to Glacier National Park in Montana. Wes added that during the warm months, he helps mow yards three days a week with Paul Miller. He is also recently married to his wife, Emily.